Azithromycin is an antibiotic belonging to the macrolide class. Macrolide antibiotics have a broad spectrum of activity and are commonly used to treat mild to moderate bacterial infections including chlamydia. It is also used in the treatment of respiratory-tract infections, ear infections and skin infections, and is considered to be a versatile and effective form of medication. 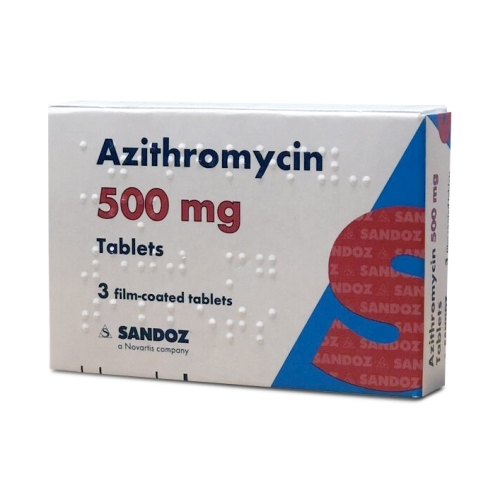 You can buy azithromycin online after completing a short medical questionnaire. Bacteria need certain proteins in order to survive, and azithromycin works to inhibit protein synthesis so that the bacteria is killed. This treats the infection and clears it from your body. How do I take azithromycin to treat chlamydia? The dose of azithromycin required to treat chlamydia is 1g (2 x 500mg tablets) taken on the first day of treatment, followed by 500mg (1 tablet) take once daily, for the next two days. Doxycycline is more effective than azithromycin, and you should only take azithromycin, if you are unable to take doxycycline. Do I need to eat when taking azithromycin? The official advice states that azithromycin can be taken with or without food, however, we recommend taking azithromycin 1-2 hours before a meal, so that food does not affect the absorption of the tablets. You should avoid drinking milk or having any indigestion remedies 2 hours before or after taking the tablets, as this may affect the absorption of azithromycin. Azithromycin starts to work as soon as it is taken. It takes around seven days to get rid of chlamydia, which is why you should avoid any form of sexual contact for seven days after you have been treated. Azithromycin has a 97% success rate according to clinical trials and is considered to be very effective in treating chlamydia. Who should not take azithromycin? Is azithromycin safe to take whilst pregnant or breastfeeding? Azithromycin can be used safely in those that are pregnant. Traces of azithromycin can be found in breastmilk and you should visit your GP to discuss the use of azithromycin if you are breastfeeding or pregnant. Can I take azithromycin if I am taking other medication? You should visit your GP or pharmacist if you are taking any medication that potentially may interact with azithromycin, you fall into the category of those in whom azithromycin may not be safe, you are pregnant or breastfeeding. Generally speaking, there is no need to visit your clinician again after treatment with azithromycin, as it has a very high success rate. If symptoms persist, there is a small chance it can still be chlamydia that hasn’t been cured, but it is more likely to be attributed to another condition. You should see your doctor about getting further tests done such as a full STD screen. Do I need to get tested again after taking azithromycin? Because azithromycin has an extremely high success rate, it usually isn’t necessary to get retested. However, if you wish to do so, you should visit your local GUM clinic, or buy an STD test kit online. You should also have another chlamydia test if symptoms persist two weeks after having taken the treatment, or you have not abstained from sexual activity for 7 days after having completed your treatment course. Those under the age of 25 who are sexually active are recommended to test for chlamydia on a regular basis. If I have been diagnosed with chlamydia, do my partners need treatment too? It is good practice for your sexual partners to be treated, as it is likely that you would have either caught the infection from them, or passed it onto them. Can I complete a consultation on behalf of my partner? Your partner would need to carry out a consultation themselves. The online questionnaire is designed to screen individual patients based on their current and past medical history, and they would need to be assessed before a prescription is issued, dispensed and dispatched from our pharmacy. All your details are stored privately on a secure system. We will never share any information with anyone, and have implemented security measures to ensure your personal details are kept safe. Your medication will be delivered by post in plain packaging, with no reference made to the contents of the package, or our company in general. Doxycycline is the first line treatment option in treating chlamydia. Some research has suggested that it is 100% effective in treating chlamydia, and needs to be taken twice a day for one week. Untreated chlamydia can present numerous health complications, and it is recommended to treat chlamydia as soon as possible. If you have regular sexual partners, you should get tested every few months in order to avoid any complications associated with chlamydia. A simple course of antibiotics is sufficient, and has a high success rate in curing chlamydia. Simply fill out an online questionnaire, and have your medication delivered in discreet packaging to a destination of your choice.